1. Oh Happy Day - featuring this wall paper wall map, 2. Wallpaper Mural Ideas, 3. HGTV, 4. Geosafari Wonder World Wall Map Set, 5. Children's Illustrated World Map and 6. Decowall World Map Wall Stickers. Caspar's previous Cycle Two classroom in Canberra has a huge world wall map. I love it and think it is such a good idea in the Cycle Two Classroom (6-9 years). Since seeing this bedroom in Oh Happy Day I've really wanted a world wall map for our home too. I found a lovely map on sale and put it up in the boys' bedroom. Ours is a wall sticker, it is really easy to apply and move around a little if necessary. The room at Oh Happy Day has a red bunk and we have a orange bunk so I was really going for a similar look. However once the map was up I didn't want to put the bunk in front of it, I wanted to keep the map completely clear. I wanted to use the map as a learning tool not just as decor. I love that as far as I know it is correct and gives the child the perspective of viewing Earth from space. Amazing for learning geography. Over the weekend Otis used some Animals of the World work which is based on continents (pictured below). I love the idea of mapping our travels, the boys can see where their dad is currently located and when he travels, we can point out where friends live and there is so much potential for not only learning about animals but oceans, rivers, mountains, flags, languages and so much more. As much as I adore wall world maps, a map this large isn't necessary. For years we used this smaller (and political) world map and it was fantastic and we used it so often for the boys to point out or to locate something. A globe (we also have a continents globe), a child's atlas and a world map (even a paper one with blu tack on the wall) are wonderful learning tools for young children. This is a nice idea at Noor Janan Homeschool. I love a good DIY continents map. This is a great example of a well travelled family - Rage Against the Minivan have pinned all the places they have been to on their wall map. I am on the hunt for really good lunch box ideas. Things like our favourite carrot and zucchini slice (that we also made today), something we can bake and use for snacks and for school lunch boxes throughout the week. I am loving the lunch box ideas at Weelicious so I trawled through the website and found some Vegetarian Baked Samosas. Even though Otis made ours they still turned out just like the pictures. We used sweet potato in place of the russet potato and garlic paste replaced the garlic powder. They have a little turmeric and cumin in them so they are flavoursome but my kids loved them. And they so easy for kids to make - all of the brushing with butter and folding is really fun. We will definitely make them for school lunches in the future. Today was Good Friday and it was just fantastic. We enjoyed the day in, being lazy and doing a little baking and it was sooo good. Foam Printing - Art Idea for the School Holidays!! During the school holidays I always have a couple of act activities planned. I put away the materials until just the right moment - when there is a rainy day or a rest day or just when the boys are getting bored or restless. I like to ensure that the boys are challenged, that they are learning and are exposed to new experiences. Foam Printing is a really good activity, it can get messy but it's safe, easy, interesting and suitable for young children. I think the results are pretty fabulous too! This is the easiest form of printing we have tried. The child uses a pencil to draw on the printing foam, the child will need to press a little so they make an indent into the foam. This is easy to do, they just need to draw with a little pressure! My children are not particularly talented and don't spend hours drawing but I still think the results are effective. We use a foam roller to cover the foam in paint. Then we place the paper on top, press down or rub over and carefully peel the paper off to reveal the printed image. The process uses a lot of paint. I also recommend using nice paint, we tried it with a bottle of old paint that was a bit cluggy and it didn't come out so well. The foam is like a plastic foam, it is really easy to wash and reuse. We did this so many times. This is so cool as you can make the same print in lots of different colours. It also allows the children to have fun and experiment. I think the black art frames are a fabulous finishing touch! A3 Printing Foam, A3 Mixed Media Paper, A3 Art Frames and Foam Rollers are c/o Child.com.au. (I can't find the same products available in the US but this might be worth trying!). This is a great article on foam printing especially if you are in a school setting. If you are looking for special and unique art activities I also recommend marbling or some simple milk and food colouring fun. A treasure hunt - we look around the house to find items that match the phonogram in this case 'ch'. Chocolate milk, cheese, chair (from Otis' dollhouse), chalk, chicks, chicken, cheetah and chimpanzee. 'I Spy' is a good game to play also. We have a basket of items that match the phonograms Otis is currently learning. He can pull the items out of the basket and form the words. Otis is using the Movable Alphabet and Phonogram Alphabet side by side. Montessori three part cards have been a big part of Otis' language work at home (three part 'sh' cards available here). This is consolidation work and also expands his vocabulary. We find three part cards enjoyable and I believe it's because we wait until we know Otis will have some success, they are not too hard and not too easy. Otis also likes using them as he can use them to demonstrate his knowledge. You can see Otis using the three part 'or' cards here. 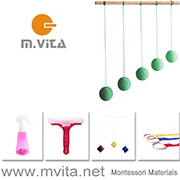 Montessori Phonogram Alphabet and Three Part Cards are c/o Maitri Learning. Puzzles - Why we love them and how we use them (at 4 years). Otis has always enjoyed puzzles and working with his hands. When he turned four we started using Ravensburger Puzzles. They have such a wide selection of puzzles that are life like and many of them are really beautiful. Child.com.au recently asked if we would like to try some of their Ravensburger Puzzles and of course we jumped at the chance. All of these puzzles are suggested for 4+ years and I have found their age recommendations spot on. Above is the Tropical Friends Puzzle (60 pieces) which I love for the colour, the child's attraction to the natural environment including animals and that it is beautiful. Above is the Busy Airport Puzzle (35 pieces). This puzzle is perfect for the inquisitive mind of my four year old. Otis really likes to look at what is going on and airports are really interesting places. We already have this Trash Removal Puzzle and it's been a favourite for 8-9 months (it is two puzzles and 2 x 24 pieces), Otis is still fascinated with garbage trucks and all of the moving parts. This is a really typical set up for us. I often present puzzles in a tray like this stored on open shelving. Otis doesn't always finish a puzzle in one sitting so I love that in the tray he can leave it or move it around. He can use it on the floor or table. In this case the puzzle fits perfectly in the tray. Above and below Otis is using the Dinosaur Playground Puzzle (35 pieces). We also have Primeval Giants Puzzle (2 x 24 pieces). While Otis isn't obsessed with dinosaurs the way some children are, he still loves playing with them and they are of interest to him. Again I love that these puzzles are as realistic as they can be and they are attractive without being cartoonish. I've mentioned it before but Otis loves to work on a floor table and this Ikea table is absolutely perfect. It allows him to sit on the floor in a way that we often see in a Montessori classroom. It's our home version of the Montessori chowki! 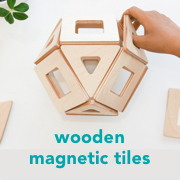 It is a really flexible option which is perfect for so much work including for doing puzzles! Child.com.au is currently offering a 20% discount on all Ravensburger puzzles using the code RAVE until 10th March 2016. Please visit Child.com.au for further details. For readers in the US I recommend Tropical Friends, Busy Airport, Waste Collection, Dinosaur Playground, Dinosaur Times, Construction Crowd and Railway Station. I found out about this Montessori concept years ago (thanks to Eve) but it wasn't until this week that I printed this calendar and introduced it to my children. La poutres du temps - the time beam is an excellent, concrete way of introducing a child (or a classroom) to the concept of days, months and years. It is a linear calendar. Our calendar is three meters long and the entire year is presented horizontally along the wall (we have ours in a passage way). The child can see the entire year in front of them! It is a great way for the children to learn all the months of the year and seasons. It makes it easy for the child to mark out dates, count down to their birthday or other significant events, to the end or the month or year and it also makes a really colourful decoration! We have a marker that moves along the beam to indicate 'today', the boys have also highlighted their birthdays. School holidays and celebrations will also be included. Small sticky notes would be perfect for this. Rather than a monthly calendar (which we still use) this gives a longer term picture. There are a few ways the calendar can be presented, some add a day at a time, use pegs or have lots of space for writing events, it can be tailored to suit your needs. Above examples at Odrai Le Blog, Alternative Montessori, Liv & Emy and Le blog de Natou. Further reading and other fantastic linear calendars can be found at Planting Peas, Grow, Grow, Grow and Rachel and les petits pois. We are using this Linear Calendar 2016 Southern Hemisphere in English. It was really easy, I printed it on my home printer onto card, cut it out, glued it together and attached to a long wall using blu-tack. It was also fun to make this calendar ourselves, Otis is rather proud! I also recently made a perpetual calendar here. We tried milling our own flour a couple of weeks ago. Today we decided to make it easier and put the grain mill at the kids low kitchen prep table. For these hand crank devices it's much easier for Otis if he can stand on the floor, he has more leverage. This is a really valuable experience teaching children where food comes from. We are using organic spelt grain and it makes flour really quickly. I've been looking around for an affordable mill and in the end decided on this one. We are going to continue to make our own fresh flour this way. The boys have also been using this hand crank cold press juicer. It is so quick and easy to use and the juicer is super affordable - it's a great find. Our juicer is from here (similar here). It sticks to the table really well and the kids can use it independently, although they need help with clean up! Both the grain mill and juicer would be fantastic materials to have in the classroom. Otis is four and it takes a bit of effort with the apples and carrots but he makes a cup of juice in a few minutes. Caspar is eight and he uses it with ease. We have also been making Ebelskivers which are delicious! What about you, what are your children currently enjoying in the kitchen?